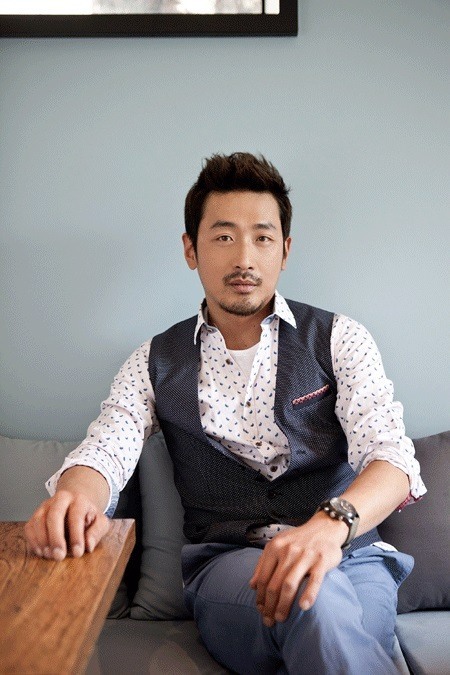 Noted actor and film director Ha Jung-woo is showcasing another talent of his -- painting. The 36-year-old, whose artworks have been presented at multiple exhibitions in Seoul, New York and Hong Kong, is holding his first solo exhibition in Los Angeles. “Pause” opened on Saturday at Pyo Gallery LA. He is introducing 30 latest works, including portraits inspired by characters in his movies and his face. It’s the second time his works are being showcased in LA. They were first shown to the LA art scene during the LA Art Show 2015 from Jan. 15-18 at LA Convention Center. It coincided with the release of his latest movie “Chronicles of a Blood Merchant” in Seoul. “Through painting, my acting expression develops, and sometimes my acting experiences are illustrated in the paintings as well,” he said in an interview with Yonhap on Saturday in LA during the exhibition opening. He added that painting, making films and acting are all ultimately derived from a single root. According to the gallery, Ha’s works reflect different personas he dealt with in movies. “Ha’s artworks explore the emotional groundwork of the various personas he inhabits, serving as a method of study and of departure from the scripted situations that appear in the movies,” said the gallery’s press release. The Seoul-based actor has become a household name in Korea, characterized by his unique, down-to-earth flair, through an array of films, including “The Chaser,” (2008) “The Berlin Fire,” (2013) and “Kundo: Age of the Rampant” (2014). The exhibition “Pause” runs through April 18 at Pyo Gallery LA.